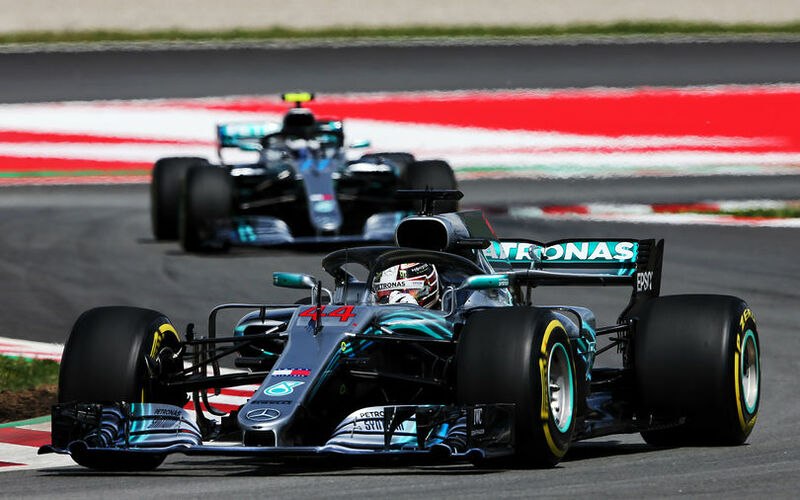 Lewis Hamilton controlled the Spanish Grand Prix from start to finish, carving a comfortable gap to the competition early on in the race as a basis for victory. Valtteri Bottas finished second while Max Verstappen completes the podium for Red Bull Racing. In preparation of the start, Lewis Hamilton led the field, and backed it up quite slowly at Turn 9, before getting on with it to take his pole position on the grid. Valtteri Bottas positioned in second, ahead of both Ferraris and both Red Bulls. As the lights went out, Hamilton made a clean start, along with the other leadings cars behind him to retain the same top 6 positions. Vettel though still managed to overtake Bottas at Turn 1. Behind them, it was a totally different story. Vandoorne went wide into Turn 1, causing a bit of trouble in the pack when he rejoined the track on the exit of turn 2. His McLaren team mate Alonso meanwhile was unable to progress as he got blocked behind a Red Bull, and then by Sainz who locked up under braking. The Spaniard had trouble to stay on track, and was then lucky to avoid Grosjean who started losing control of the rear of his Haas through Turn 3. The Frenchman strangely stayed on the throttle, probably hoping to spin the car rapidly. But as he did so, he rejoined the track, creating a violent collision with Hulkenberg and Gasly. All three men were unhurt, but they all retired and forced a safety car out on track to allow marshalls to clear all the debris and oil. Behind the safety car, Magnussen ran in 7th, then Sainz, Leclerc, Ocon, Alonso, Stroll, Perez, Vandoorne, Ericsson, Hartley and Sirotkin. At the end of lap 6, the safety car left the race track. Hamilton timed the restart well to keep Vettel at bay, but there were in fact no position changes before Turn 1. Only Alonso moved up a positon by going round the outside of Ocon through Turn 3. The Spaniard is notably the only one of the field using super soft tyres. All others are on soft, except for Ericsson. Hartley and Sirotkin had already switched to medium tyres in their early pitstops. By lap 16, Hamilton had pulled a gap of 7 seconds to Vettel. Bottas remained close to Vettel while Raikkonen followed at 3s. On lap 18, Vettel became the first to pit, changing to medium tyres and rejoining the race in 7th, behind Magnussen and ahead of Sainz. Funnily, one Mercedes guy was very keen to inspect the state of Vettel's old soft tyres as the Ferrari mechanics rolled them back into the garage. A single lap later, Bottas pitted for mediums as well, coming back on track just behind Magnussen right at a moment when Vettel passed the Dan. Bottas easily made the pass as well the next lap. On lap 22, Alonso pitted to exchange his super softs to mediums as well. He returned to the track in penultimate position, ahead of Stroll who had also recently pitted. Two laps later, Raikkonen rapidly reduced speed and saw both Red Bulls pass by. When nearly coming to a halt at Turn 3, he was told to make some switches on the steering wheel, after which he rapidly returned to speed. He still entered the pits at the end of the lap to retire from the race. Hamilton pitted soon after that, returning to the track in between Verstappen and Ricciardo. Vettel at the time was at 6 seconds of Ricciardo and chased by Bottas. Further back, Ericsson, Sainz, Leclerc and Alonso drive closely together, as both Saubers proved extremely difficult to pass. Ericsson opted to always defend the inside line into Turn 1, while Alonso seemed unable to get aside of Leclerc's Sauber. As Hamilton stayed close, but could not really make an attempt to pass Verstappen, Ricciardo opted to be the first of the Red Bulls to pit, changing to medium tyres on lap 34. Verstappen pitted one lap later. This resulted in Hamilton taking the lead yet again, with 10.7s in hand on Vettel, and another 2 to Bottas. Verstappen trailed another 9s further back, and Ricciardo 8 additional seconds. On lap 41, Ocon parked his car alongside the track with a smoking engine. The resulting virtual safety car triggered some pitstops, including one for Vettel who took on new medium. Sirotkin managed to spin in this period while Verstappen broke the left front wing endplate on his Red Bull when coming a bit too close to a Williams. When the race was on again, Alonso was alert and finally managed to get past Leclerc, a Sauber whose rear end he had been investigating for more than 10 laps. The other McLaren with Vandoorne at the wheel had enough of it two laps later, after which the Belgian reported "I lost drive". He parked his car out of the way, allowing the remaining 14 cars to race on without interruptions. It later emerged a gearbox issue was the cause for his retirement. Even though Hartley managed to gain a point-less position 2 laps from the end, positions were fairly stale in the last laps. Vettel remained at 2s of Verstappen and seemed unable to do anything while Ricciardo was busy doing slower and faster laps to secure the fastest lap of the race, knowing there were 20s gaps ahead and behind him. The end result was a beautiful one-two finish for Mercedes with Verstappen completing the podium.